Hubby and I love white sweet potatoes. 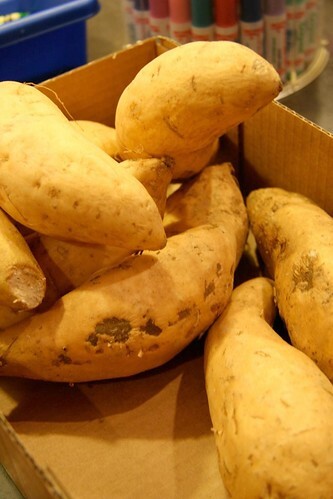 They appear in the market around US Thanksgiving (aka November, not October) and are moist and fluffy like white potatoes, but are sweeter and have higher fiber like sweet potatoes. We bake them and serve them as a side dish constantly. But the problem with them is, they’re very delicate. They are finicky, actually, about their storage. Too warm: they get soft icky spots within days. In the fridge? Fuggedabahdit. Potatoes should be kept in a cool, dry place, preferably dark with some air circulation, and optimally between 45-50°F. Here’s what I did to create that environment. In my house, the basement is dark, but hot. The furnace is down there, as is the hot water heater, and the washer and dryer, and it’s not such a big place that it gets a lot of ventilation — so the basement is not a good potato option. The kitchen is the newest part of the house. Our house was likely built in the 1920s, maybe the 30s, and as a result is about as well insulated as a piece of muslin. But the kitchen and the addition off the back of the kitchen are brand spunky new, and as a result are very well insulated. Add to that the cooking I do, and it’s warm in there. Not a good potato option, either. But I don’t want to store my potatoes in the cooler rooms of the house, like upstairs on the second floor or in the kids’ playroom. So here’s my slacker solution. 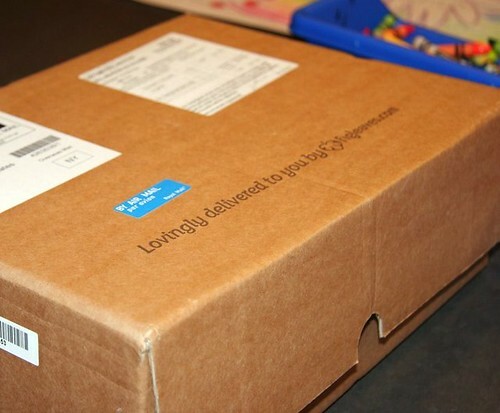 First: a large cardboard box. 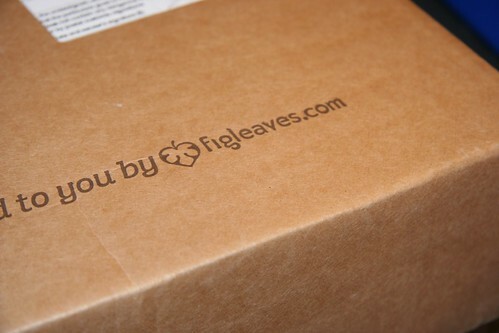 Figleaves.com sent me some bras (woo!) in this one. “Just the right size for… potatoes!” I thought. What, you don’t equate bras in larger sizes with potatoes? Why on earth not?! This box is awesome. So is Figleaves, because they have good sales and you can search for bras by cup size, chest measurement, color, and price. And they have an entire category devoted to DD+ potatoes. WOO! Anyway, back to my other, more different potatoes. 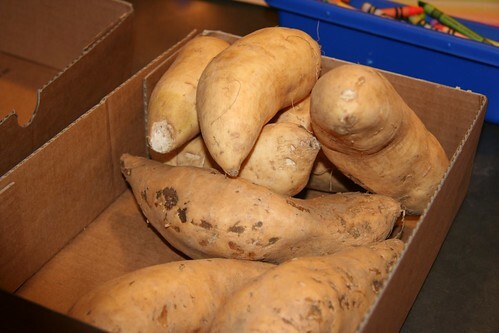 I took my mountain of sweet potatoes (ok, I might have gone a little buck wild in the produce department, I admit it) out of the plastic bag, and put them in the box. No plastic, nothing moist or absorbent in there except for the cardboard, which is not waxed. Then, I put it in the closet against an exterior wall of the house, far from the radiators (our house is old and has steam heat), the oven, the bathroom heater, and the basement door. Voila! A perfect potato place, where it’s dark and dry, there’s air circulating, and it’s pretty cool – about 55-65F. Not as cool as the potatoes might prefer, but they kept for a week in my slacker potato storage box, which is way longer than I’d been able to keep them edible before. So there you have it: it’s not even a craft. It’s slackerdom mixed with a serious love for potatoes. If you see these in your grocery store, they’re probably with the yams and the plain white baking potatoes. They’re wonderful baked in the oven, served with butter and a little salt. Enjoy! Shhh, I forgot to post this so I’m sneaking it in. My weekly menu this week is highly abbreviated because I’m going to be out of town for two days, and then the two days after that I have Christmas parties. So NO COOKING for four days. Four! I won’t know how to act. I think it’s a good thing I don’t have to cook this week, though, because I had a hard time menu planning this week. My head’s not in the cooking game after Thanksgiving! Sunday: venison sausage and fried potatoes, topped with egg over easy. Tuesday: Breakfast for dinner. Eggs, bacon, pancakes, hash browns. I don’t know about you, but I’m already tired of turkey. But we still have turkey leftovers and it WILL get used. I hate throwing leftovers away. Today for lunch we had homemade turkey soup (recipe coming Tuesday) and tomorrow for dinner we’ll be having Turkey Pot Pie topped with Garlic Biscuits. And that, I hope, will be the last of the turkey. But I love to see what other people are doing with their leftovers, so I gathered a few links. At Baking Bites, she’s making leftover turkey sandwiches with cranberry-barbecue sauce. I have to tell you, I do have leftover cranberry sauce because I’m the only one who eats it (but I still make it myself). She’s also got other leftover sandwich ideas for you to try out. The Kitchn at Apartment Therapy gives several posts with ideas for leftovers, including hand pies, panfried stuffing, sweet potato and cornbread hash w/gravy, and turkey pot pie. For the most unique leftover recipe, it’s The Barefoot Kitchen Witch and Thanksgiving wontons. I actually had a similar recipe printed out and bought the wonton wrappers last year at Thanksgiving to make these, but never actually did. Now I wish I had wonton wrappers in the house so I could do this for dinner tonight. Anyone have any other great leftover recipes or ideas to share? That’s me! Today anyway. I’m not blogging here but I blogged at THREE other places today. At author Lauren Dane’s blog for her Writerly Wednesday post, I blogged about finding time (to write, edit, promote or do whatever it is we want to do). At Whipped Out, I wrote about my Thanksgiving menu and shared links to the recipes I’ll be using. And at the Carina Press blog, I asked for help! Happy Thanksgiving to my US friends! I’ll be cooking up a storm for the next two days and then, Friday? Shopping!